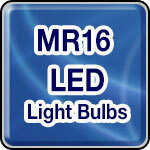 MR16 LED Replacement Light Bulbs: MR16 is one of the better applications for LED because of it's directional nature. MultiFaceted Reflector (MR) lamps - LED MR16 Light Bulbs provide similar light output and beam profile while using only a fraction of the energy. Genesis Lamp has an growing selection MR16 LED replacement light bulbs at great pricing... all available online. MultiFaceted Reflector (MR)16 LED lamps are used in place of incandescent light bulbs for both residential lighting and retail lighting applications.